Who doesn’t love a pav? The go-to summer hit gets a wintry makeover with a hint of brown sugar, clouds of cinnamon cream and a dark berry and wine compote. Make it as one large meringue, or create daintier individual ones. Cook the meringue up to three days ahead, then store in an airtight container, or freeze for up to a month. 1 Preheat the oven to 140˚C, gas mark 1. Using electric beaters (or a freestanding mixer) whisk together the egg whites, a pinch of salt, the caster and light brown soft sugars to stiff peaks. Sift over the icing sugar and cornflour and continue to whisk for 3-4 minutes, until glossy and stiff peaks form. Whisk in the vinegar and vanilla to finish. Use baking parchment to line a large baking sheet and secure by dabbing a bit of the mix under the corners. 2 Spoon all the mixture out into the centre of the baking sheet and use the back of the spoon to create a dip in the centre, gently easing the meringue out to form a plump ‘nest’ about 25-30cm diameter. Bake for 1 hour 25 minutes, until crisp on the outside but barely coloured. Turn the oven off and prop the door ajar (with a tea towel). Cool in the oven for 30 minutes, then remove and set aside to cool completely. 3 Meanwhile, make the compote. Put the sugar, wine and spices in a saucepan and warm to dissolve the sugar. Bring to the boil, then simmer for 10 minutes or until the wine is reduced by 2/3. Add the fruit, reduce the heat to low and cook, stirring often, until heated through, about 3-5 minutes. Set aside to cool completely; discard the whole spices before using. 4 Just before serving, whisk the ingredients for the cinnamon cream together until just holding its shape. 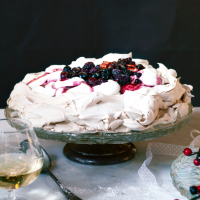 Drop spoonfuls of cream into the centre of the meringue and top with the compote, drizzling over any juices. FYI: For individual meringues, pile 2 heaped tbsp meringue onto the parchment. Use the back of the spoon to create a dip in the centre, easing the mixture out to form a ‘nest’; repeat to make 6 meringues, spacing them out well. Bake for 50 minutes.